Saint Patrick’s Day is only a few short days away, and while I know corned beef and cabbage is going to be on many an Irish dinner table that evening, I think this year we are going to shake things up just a bit and have beef stew. But not just any beef stew…beef stew that has been cooked slowly and lovingly all afternoon in a simmering bath of Guinness draught. Tender beef with lots of veggies and a sauce that will bring you right back to the old country, even if you have never been there. I’ve been there, myself. 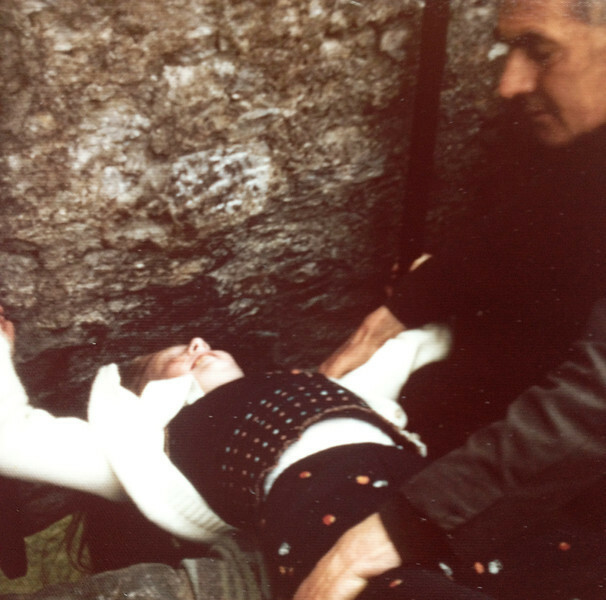 One of my favorite childhood memories is the summer I went to Ireland with my grandparents. One of the Irish cousins was getting married, and why I was the lucky grandkid picked to go over with them for the wedding is now lost to the mists of time, but I packed up my hot pink Samsonite suitcase and off we went. My mother conveniently sent me over with this outfit that was the exact colors of the Irish flag. 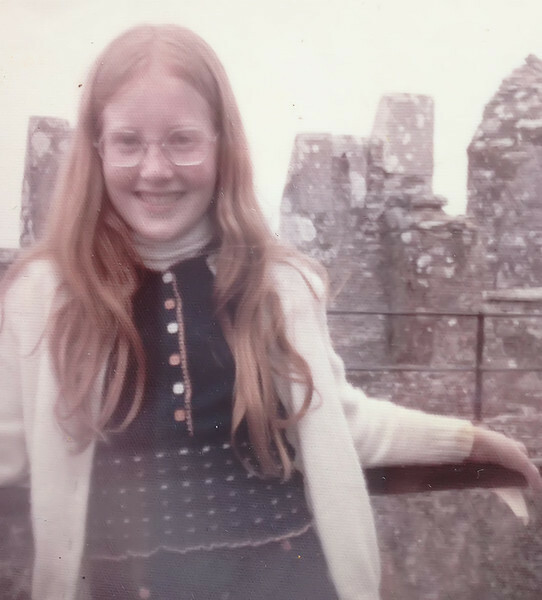 And amidst all the many visits with the many Irish cousins from one end of the country to the other, at some point we visited Blarney Castle, where I of course needed to kiss the Blarney Stone. (Yes, those of you who know me personally – it all makes sense to you now, right?) Kissing the Blarney stone is a little more complicated than you might think. It involves lying on your back with your head hanging upside down inside a kind of high opening which is is sheer drop down to the ground, your legs being held by a guy whose job it is to hold folks’ legs so they don’t plummet down to earth. You need to be MOTIVATED. Or twelve years old, one or the other. Joe Don Baker, where are you now? 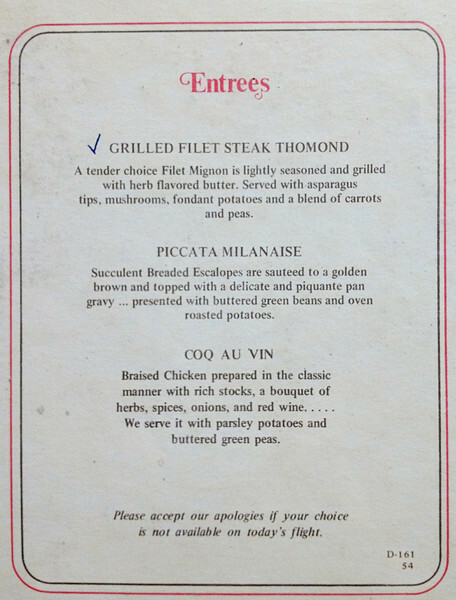 I also kept the menu for one of the flights, and from my neat check mark I’m guessing I had the Grilled Filet Steak Thomond. Which I’m guessing is a reference to the Earl of Thomond restaurant in County Clare, which I only know because I just Googled “Thomond Steak” and that’s what I got. I promise I am now getting to the point, which is that like Grilled Filet Steak Thomond, this Guinness beef stew is a warm and wonderful concoction of beef, vegetables and a lovely sauce. You do need to hunt down some of this. You’re going to start this stew on the stovetop just to get things simmering away, but the real cooking is going to happen in a low-temperature oven, so I highly recommend using a Dutch oven if you have one so you only have one pot to wash at the end of all this deliciousness. The oven will concentrate all the beer and broth and other wonderful ingredients down to a flavorful perfect sauce, and although there are potatoes in this dish, if you need some bread on the side to make sure you get every scrumptious drop, I totally understand. I’ll be back on St. Patrick’s Day with my all-time favorite Irish recipe ever. Ever! Until then, enjoy this stew, and may the road rise to meet you. Season beef with salt and pepper. Heat oil in Dutch oven over medium high heat and add onions. Stir until they are starting to brown, about 5 minutes. Add tomato paste and stir until well-combined. Stir in flour, and then whisk in broth, 3/4 cup Guinness, sugar and thyme. Simmer for 3 minutes. Add beef and stir. Transfer the pot to the oven and cook uncovered for 90 minutes. Add potatoes and carrots to the pot, stir and continue cooking until the meat and veggies are tender, another 60 minutes. Add remaining Guinness, stir and add salt and pepper as needed. Sserve on warmed plates, garnished with parsley. Always looking for a good Irish stew recipe. This looks amazing. I remember kissing the Blarney Stone as a kid. It seems a bit scarey until you just get in there and do it. 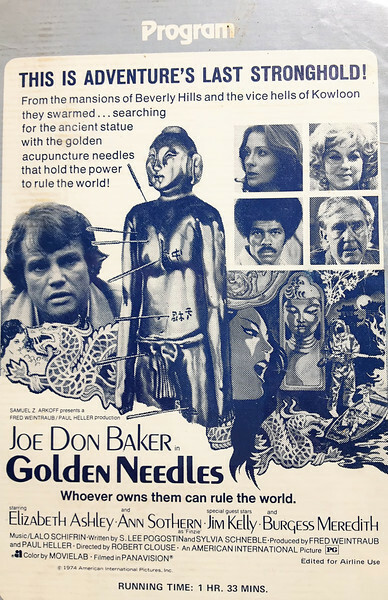 Re Joe Don Baker, he was in an Eighties production of an excellent series called The Edge of Darkness, not to be confused with the recent Mel Gibson movie of the same name. See if you can get the series on DVD. It’s $25.83 on Amazon! – 8 copies left, excellent reviews. A friend of mine used to have Edge of Darkness parties to watch it when on television here. OK, I’m in!! Amazon, here I come. How awesome that you literally scrapbooked EVERYTHING from the trip! I wish I had done that with trips of yore. 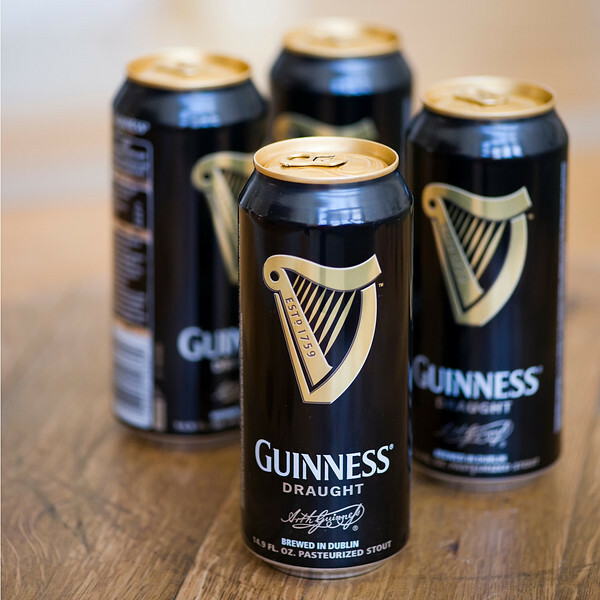 I always have guinness on hand for chili and i’m sure it’s fabulous in stew as well! This looks awesome! 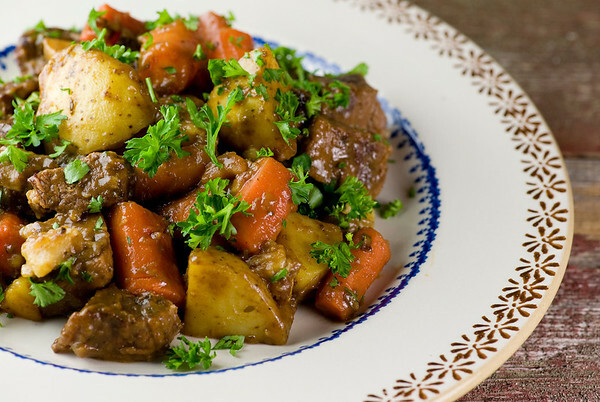 Love Irish Beef Stew – esp with a few splashes of Guinness! Happy SPD!! Just to be certain, as you don’t mention browning the beef, I’m assuming that’s what you meant. Straight into the liquid, right? (Hope so – I dislike browning.) It looks fabulous. Yep, straight into the liquid! Some of the liquid will cook off leaving part of the meat exposed and you will get a nice brown surface with no browning. Yay! I made this stew this weekend and It was great! I ended up serving it with buttered Egg noodles because I had a crowd eating it and wanted it to stretch a little further. Even better the next day! Made this beef stew yesterday and it was really good – I used a little more Guinness (the whole can). But we really enjoyed it – thanks ! I like to use the crock pot, especially with stews! (We work late so time is of the essence!) can this recipe be adapted to cook in the crock pot! (With all those smilies, you’d think I drank the Guinness. But I didn’t.) Resisted that last smiley. This was so much better than regular stew; I will never make it the old way again. The meat nicely caramelized in the oven, with the sugar and guiness, and the only change I made was to add some parsnips and turnips along with the potatoes and carrots. I was tempted to add the beer all at once at the beginning, but it really adds flavor when you add it in the end. Thank you once again for a game changing recipe! I love that! What a one in a million job to have, right?